The growing trend of medical practices transitioning to cosmetic practices is due in part to a variety of reasons including rapidly improving technology and increased consumer awareness and demand. An additional issue causing practices to transition is the ever-increasing bureaucracy around medical procedures and payment. 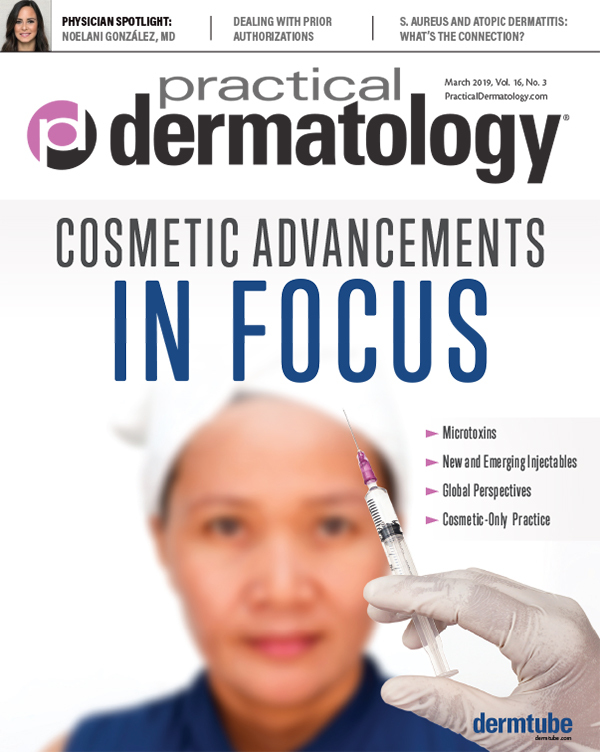 With more and more patients seeking board-certified dermatologists, practices are making a change and seeing happy, satisfied, and returning clients, willing to pay out of pocket for professional procedures. 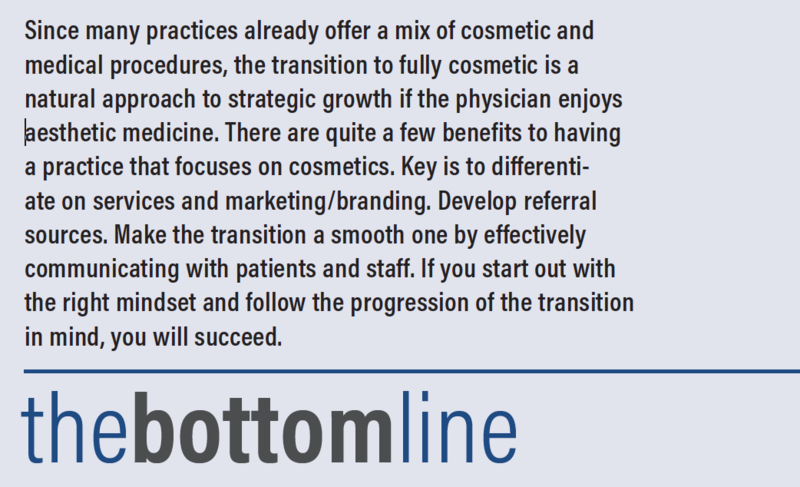 Since many practices already offer a mix of cosmetic and medical procedures, the transition to fully cosmetic is a natural approach to strategic growth if the physician enjoys aesthetic medicine. There are quite a few benefits to having a practice that focuses on cosmetics. Without the headaches of managed care, there may be a less stressful environment for employees and owners. There is no need for pre-authorizations for office visits or procedures. There is no outside influence dictating the amount that you can or cannot charge for your expertise. As a result, you can set your schedule in the way traditional medicine originally operated where patient care comes first. As you are able to spend the appropriate amount of time with patients and they are aware of your fees, the physician, the employees, and the patient are often happier and more relaxed. 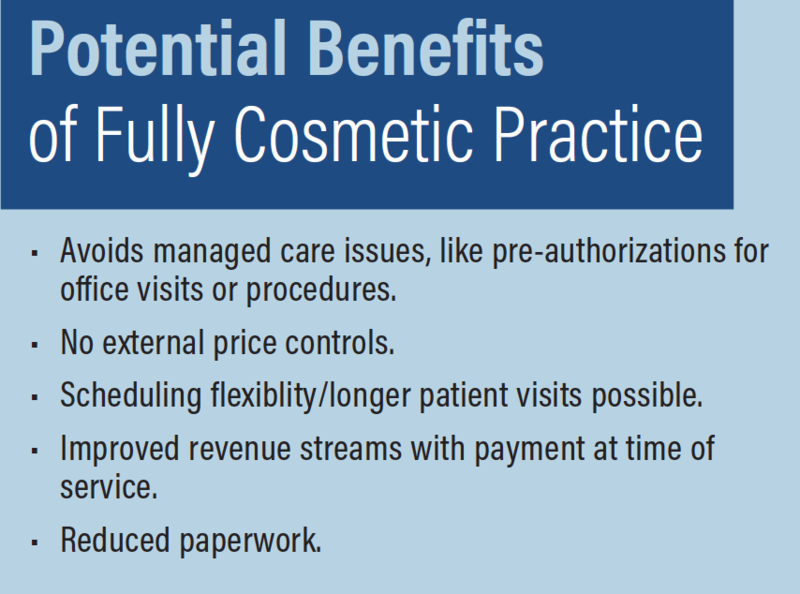 Other benefits of aesthetic practice include streamlined operations. Without having to verify patient benefits, you do not need a full time staff member to negotiate the current managed care nightmare. You will be paid your set fee at the time of service or you do not need to see that patient. Very rarely will you perform a procedure and not get reimbursed appropriately. When moving towards a cosmetic dermatology practice, there is less paperwork and often no need for electronic medical records (EMR) recording useless data for MIPS or whatever the current requirements include. This makes for a better work life balance. Whether you are in the midst of a transition or just looking into it, you will need to decide what products and treatments you will make available. 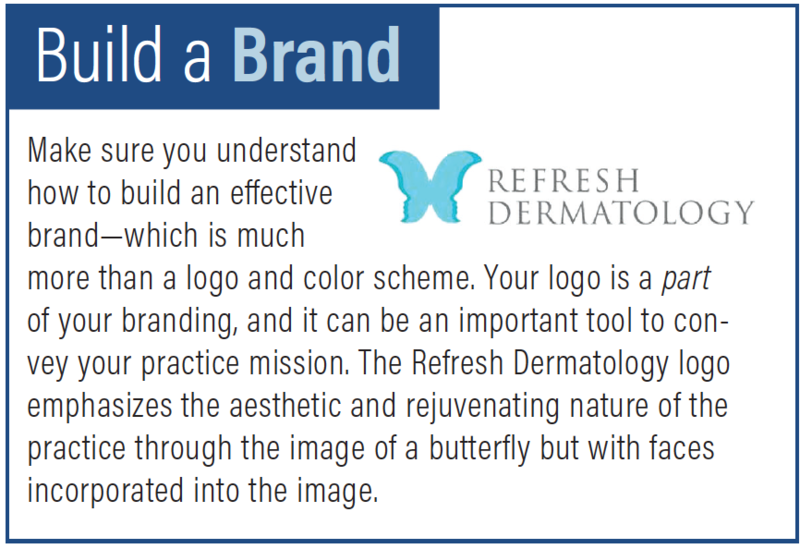 Your practice will be based on cosmetics and your skill will be a large part of your branding. Begin on a successful track by training staff and keeping them up to date on the changes that will be happening. Determine whether the transition will be a quick makeover or a slow switch. Inform your patients when you are ready with a target date so they can get excited about the changes. Since your patients will be paying you directly for cosmetic treatments, their satisfaction, feedback, and referrals are important. Aspects of the practice that you might have not considered previously are now important parts of your overall image. Simple things like the ease and location of parking, the layout and ambience of the office, and the demeanor and communication of staff will affect the overall experience. Cosmetic practices are often more actively engaged in marketing and social media. Building a brand around your practice, your customized treatments, and your choice of tools or products is more important now than ever. With an ever-increasing demand for the newest technology in cosmetic dermatology, as a practice you want to stand out with your experience and expertise as a value to your patients. Communication and marketing should highlight the transition of your practice as a feel-good way to help patients with common cosmetic concerns. The marketing plan is one area that will require significant attention. There are multiple resources to utilize, including your colleagues that have made this transition. When using an outside consulting company, consider their end clients’ experience and success (i.e., would the client hire the company again?). Throughout the process, take your time. It will be very beneficial to you, your practice, and patients if you take the transition step-by-step with a proper plan. Begin by introducing more of a cosmetic approach. Then make the switch in two stages if at all possible. Initially keep some medical hours, so you can follow up with your favorite patients and while you maintain a predictable income stream. To start, block one half day of clinic for aesthetic only patients. This helps staff, as well, as there will be more predictable appointment times and there is no abrupt change of pace. The second stage of the transition will occur after a matter of months. As your cosmetic dermatology practice is fully in place, connect with a colleague or practice to refer patients who are looking for services you exclusively offer. Have a reciprocal relationship, so you can provide referrals to one another. Be extremely aware and respectful of your referral source. If that practice offers neuromodulators and the patient is sent for a laser treatment, only offer to treat the condition for which the patient was referred. 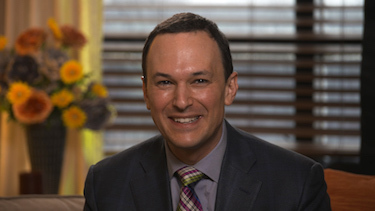 Making changes while operating a dermatology practice can seem overwhelming. However, avoiding it when you know it is the right direction, will only hold you back. Take the time to make the transition a smooth one by effectively communicating with patients and staff. If you start out with the right mindset and follow the progression of the transition in mind there will be nothing but success for your patients and your practice. Kim Campbell is Founder CEO of Dermatology Authority, which is the leading matchmaking agency for the dermatology market. She can be reached at DermatologyAuthority.com or call 800-577-0125. Kim Campbell is the Founder CEO of Dermatology Authority, which is the leading matchmaking agency for the dermatology market. Dermatology Authority helps practices grow by adding providers, practices, marketing, and practice start up services. If you are looking to advance your career, Ms. Campbell can be reached at DermatologyAuthority.com or call 800-577-0125. Suneel Chilukuri, Md, Faad, Facms is Director of Cosmetic Surgery and Chief of Dermatology and Dermatologic Surgery at Refresh Dermatology in Houston (RefreshDermatology.com).